I’m hosting another podcast, New Books in Popular Culture on the New Books Network. 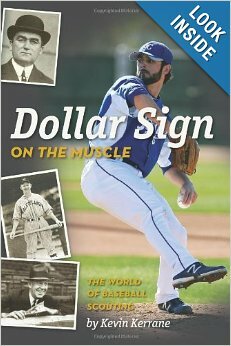 First episode is with Kevin Kerrane, author of Dollar Sign on the Muscle. James Miller and I have started a podcast on Russian media and politics for the Interpreter Magazine. Each Wednesday we’ll look at two stories from the magazine, focusing on what media inside Russia tells us about America’s relationship to that part of the globe. We’d love to have some questions to answer, tweet to @mediastudied. An interview with the Wesleyan alumni newsletter. The Catcher was a Spy by Nicholas Dawidoff, I’m Glad You Didn’t Take it Personally by Jim Bouton, Juiced by Jose Canseco, Going the Other Way by Billy Bean, Men at Work by George Will, Moneyball by Michael Lews and a lot of more famous books I haven’t read but could pretend I have by listing them here. Wonderful/terrible scenes of Miguel Tejada’s life growing up in the Dominican Republic. Narrative is a little jumbled as it moves back and forth between Tejada’s story and the history of Latin baseball, but it excels both in terms of baseball journalism and social analysis. For a few minutes after reading it I wanted to be too cool for it, so I tried to dismiss it as “basically just if Don Delillo fictionalized his own version of Ball Four.” Then I realized that would be one of my favorite possible books. So, this is one of my favorite books. Not just about baseball, but if I didn’t put this on I’d have to list Bo Knows Bo, which is not a reasonable thing to do. Weinreb tells you stories from the 80s, many of which involve Bo, and all of which 30ish year old sports fan already know all about. And yet he makes these stories sort of collide and connect in new ways that bring them totally new (and way more fun) meanings. Imagine if Lena Dunham were half as needy, twice as witty and wrote about baseball. I read this when I was seven, so don’t quote me, but I think it’s about a kid who can’t hit, but then a fake Babe Ruth may or may not appear to him in a vision, then he becomes so good that he either hits a home run or gets IBB’d every time. So if you thought something was missing from the Game of Shadows version of the Barry Bonds affair, here’s a theory at least. A very famous, very great book. For all of its tell-all, look-what-Mickey Mantle-did! appeal, the best parts are when Bouton brings to life unusual, unfamous characters like Norm Miller or George Bamberger. A comic short story collection of and about the 1910s. Reading it is sort of a hybrid experience of studying baseball history and following a narrative. Parts remain funny and certain character traits still seem witty and insightful, but mostly its just fun because the narrator in your head keeps reverting to an old-timey radio guy voice. All of the annual abstracts are wonderful, but this one is my favorite, primarily for the “Rookie” study. In it, James breaks a lot of new, analytical ground on things such as how a player’s age impacts his future value. But what’s most impressive and interesting is his direct, unapologetic look at the way race impacts a player’s development over the course of his career. James grapples, displaying admirable nuance and clarity, with the fact that white players lose their speed faster than black players, as evidenced by a simple but persuasive empirical analysis. He complicates the simple race-genetics argument in a way you probably wouldn’t expect from a baseball preview book written almost 30 years ago. It’s maybe a little prone to cultural essentialism, but Whiting’s account of baseball in Japan is equally illuminating and entertaining. It’s about the late 80s so both Japan and America have changed, but nonetheless this book remains the best example I know of using sport to explain the difficulties of intercultural communication.